Airlines laid on extra flights to the Indonesian holiday island of Bali on Thursday to allow thousands of passengers stranded for days by an erupting volcano to fly home as a switch in wind direction blew the ash away. But a plume of smoke and ash still rose above Mount Agung on Thursday and the volcano, whose crater glows red, continued to rumble. Bali airport reopened on Wednesday after being closed on Monday. The airport on neighbouring Lombok island was closed. China Southern Airlines and China Eastern Airlines sent planes to fetch more than 2,700 Chinese tourists from Bali, Xinhua news agency said. Korean Air said it had sent a charter flight. Jetstar said it would fly 3,800 passengers on 10 scheduled flights and six relief flights back to Australia on Thursday. It also encouraged customers booked to fly to Bali up to Dec. 7 to look at alternative destinations. From January to September, Bali received 4.5 million foreign tourists, nearly half of the 10.5 million arrivals in Indonesia. Chinese have overtaken Australians to become the top visitors to Bali, representing around a quarter of arrivals on the island. Losses in revenue could be more than $650 million since the volcano warning level was first raised in September, Indonesian Tourism Minister Arif Yahya estimated. 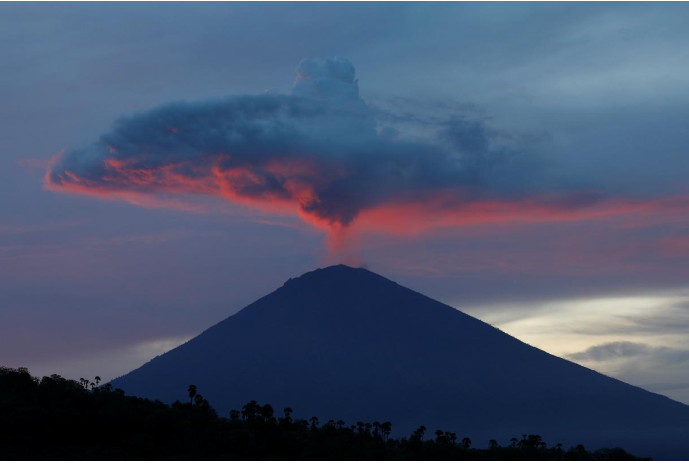 Agung looms over eastern Bali to a height of just over 3,000 meters (9,800 feet). Its last major eruption in 1963 killed more than 1,000 people and razed several villages. Authorities are urging people living up to 10 km (6 miles) from the summit to move to emergency centres, but tens of thousands don’t want to leave their homes and livestock unattended. The disaster mitigation agency said on Wednesday about 43,000 people had moved to shelters, but many were thought to be staying put as up to 100,000 people are estimated to live within the danger zone. “We cannot predict whether it will be bigger than 1963, but ... according to our evaluation the potential for a full-scale eruption is still high,” Devy Kamil Syahbana, an official at Indonesia’s centre for volcanology and geological disaster mitigation centre, told Reuters.